Review by Christopher, seminary student extroadinare, husband, father and a really good brother (who has good tastes in books, what can I say?). In The Betrayal : A Novel on John Calvin, author Douglas Bond has sought to bring to life the world and experiences of the great Protestant Reformer John Calvin, as seen through the eyes of a (fictional) antagonist who is at the same time the protagonist and narrative voice of the novel. Published this year to coordinate with the 500th anniversary of Calvin's birth, I was excited to read this book and found much that was satisfying in it. The author sets the historical stage with detailed accounts of the spread of the Black Plague through Calvin's hometown of Noyon, France and, later in the novel, of the persecutions that befell Protestants in Paris. Because of these compelling renderings of gruesome events, I would not recommend the novel for young readers. It is instead accurately categorized by the publisher as “Adult Historical Fiction”. More than anything else, the book is hallmarked by its historically accurate rendering of Calvin's life and personality. Weaving the story with flashes of excitement – such as Calvin's flight from Paris when the Crown sought to capture and kill him – Mr. Bond introduces us to the sober, godly, caring, and kind heart of the man who is all too often lost in debates about the doctrine named for him. John Calvin the man is someone we could all benefit from knowing, and the author of The Betrayal affords us that opportunity. Seeking to keep the dialogue as faithful as possible to the historical context and persons involved, Mr. Bond has culled most of the repartee from Calvin's published works and personal letters. (At the end of the novel there is a helpful “Guide to Further Reading” which lists the primary sources from which Mr. Bond drew the dialogue for various subjects.) This works fairly well for the majority of the novel, but the weakness of that method is made somewhat evident in the early portion which records Calvin's childhood. Though all the records show Calvin was a brilliant student from his youth, the dialogue still comes off as stilted when you realize that preteen Calvin is being quoted as saying what he would actually write when he was in his twenties or older. While much light has been (justly) shown on Martin Luther's life and walk with the Lord, much less has been said or published about Calvin's personal experiences on a popular level. This novel helps to fill that gap and does so well. 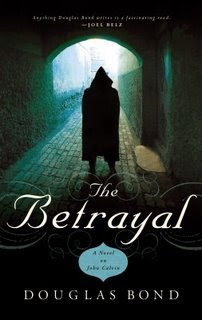 I found The Betrayal to be an enjoyable and rewarding read, and hope that you will as well. If you'd like to do a little more indepth reading on Calvin, see Christopher's review of Calvin in the Public Square. Love the cover. This is something that I'll add to my list - it sounds so interesting. Hmmm...it has been a while since I've picked up a historical fiction and I am looking forward to reading this one for sure! Straight to the top of my reading list! Thanks for posting this review, I had not even heard about this book before.